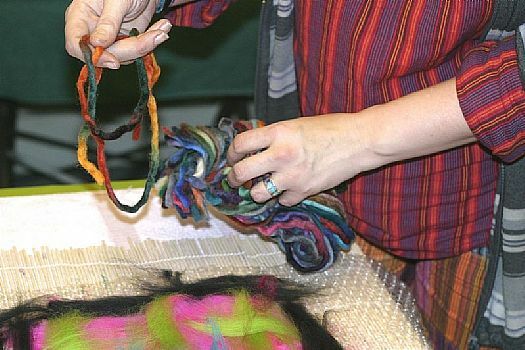 Felt is one of the oldest ways of making fabric, it is thought to have been around for about 8000 years. It was probably discovered when wool was placed inside foot coverings to help insulate them. Sweaty feet and vigorous agitation from walking soon matted the wool into a strong, warm fibre that could be cut and sewn into various other garments - albeit smelly ones in those days!. It has even been used as armour because of its strength and density. Felting happens because every strand of wool is covered by tiny scales. 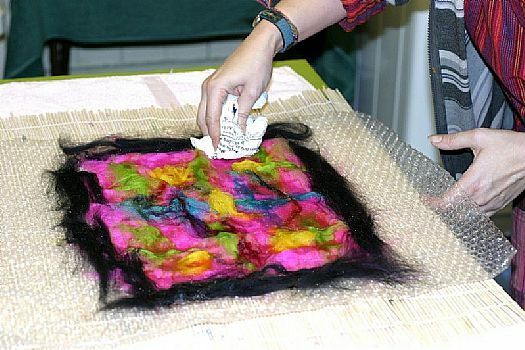 The primary mechanism of felting is abrasion. 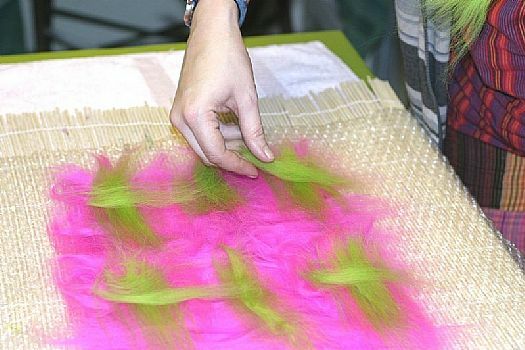 As the individual hairs get rubbed together the scales catch on each other, and the effect is that the whole thing shrinks in an irreversible way to make a mat. A bit similar to waking up in the morning after a restless night and finding your hair going into an immutable 'bad hair day'. 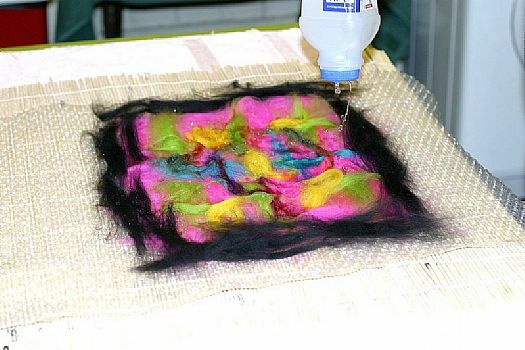 Heat and alkalinity will both help the scales to open out and will speed up the whole felting process. All wool will felt but some types are faster and more efficient at it than others. You should always use carded wool - wool that has been combed so that all the fibres lie in the same direction. It is much easier to work with. 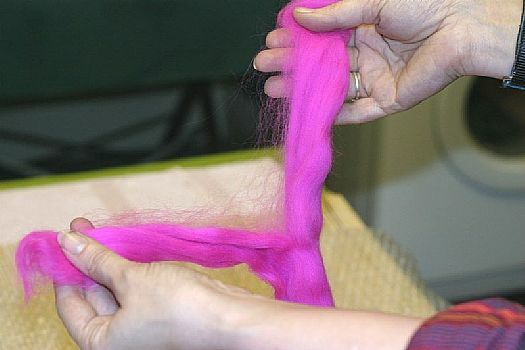 The best wool for felting is Merino with a quality count of 64. So, let me start with a list of necessary ingredients to start making a sumptuous piece of felt. Merino 64's wool in as many colours as you like. For this demonstration I have used only a small amount of wool. To make a hat, for example, you would probably need about 100g. (4oz) - maybe more. 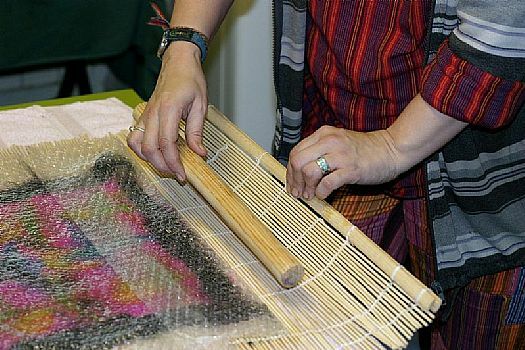 A bamboo mat or chinese blind for rolling the felt. A thick piece of dowling or section of broom handle. 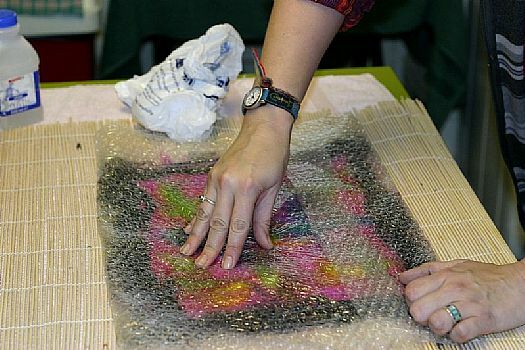 Bubble wrap (small bubbles NOT large), at least double the size of the piece of felt you intend to make. Towels, the more the merrier. They will get wet but not stained. Making felt is messy. Choose where to work carefully. You will need to be near a source of water - I mean a faucet as opposed to by the shores of a lake! You will need a kettle to boil the water and a sink. I usually work on the kitchen table but do be aware that you will probably get a lot of water on the floor. Start by placing your biggest towel on the table. Cover this with your bamboo mat. I use a Chinese blind as it gives me a bigger work area. If you are doing this then you will need to have it open so that the blind can be rolled away from you. Place the bubble wrap on top of this with the bubbles up - this is to help agitate the wool. Fill your plastic carton with hand hot water and a generous squirt of washing up liquid. Through the holes in the lid, sprinkle water onto the bubble wrap. Not too much, just enough to wet it slightly. Dry your hands completely and let's attack the wool. Carded Merino 64's wool will come in a continuous thick strand called a roving. Treat the wool softly, the harder you tug at it, the more it will resist. Pull the strand apart into two pieces and gently pull off a length of about 30 inches. Grasp the end of this thinner piece of wool firmly and gently pull off a small piece from the end. 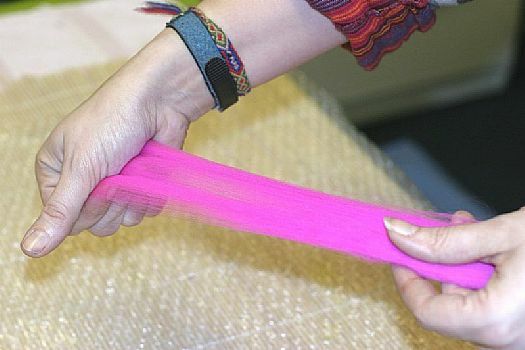 Place this small section onto your bubble wrap with the fibres going horizontally. Pull the next piece off and place next to the first one. You continue like this until you have made a square of wool with all the fibres going in the same direction on top of the wetted bubble wrap. Now go through the same process again on a second layer but place the wool so the fibres are at right-angles to the previous layer. The more layers of wool you put down like this, the thicker, firmer and stronger the finished felt will be. When I am making a hat, I would have at least 6 layers of alternating fibre directions. For this piece, I will just use these two layers. Now for some decoration. This is the fun bit. No limits but your imagination. I have placed some different colours of wool on top of my layers. Also a bit of ordinary knitting wool and some silk fibres. 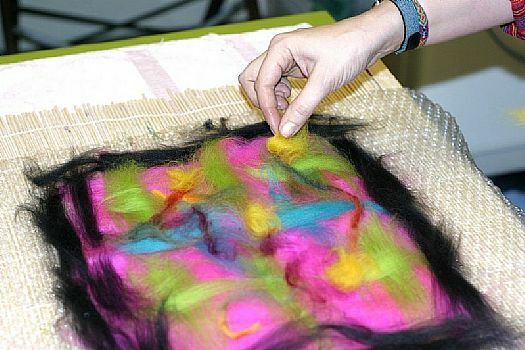 Silk is very effective in felt-making because as it does not felt or shrink like the wool, it is therefore distorted into interesting unpredictable shapes when the wool felts around it. The scales on the wool will catch the silk fibres and hold it fast. 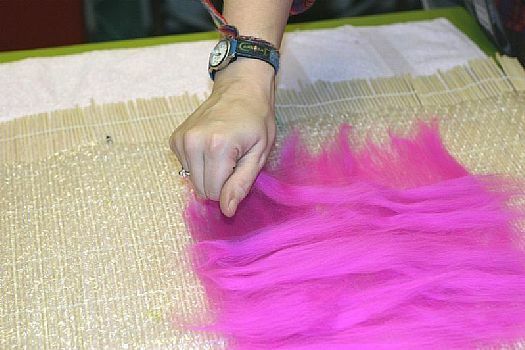 This is why any openweave fabric works nicely in felting. 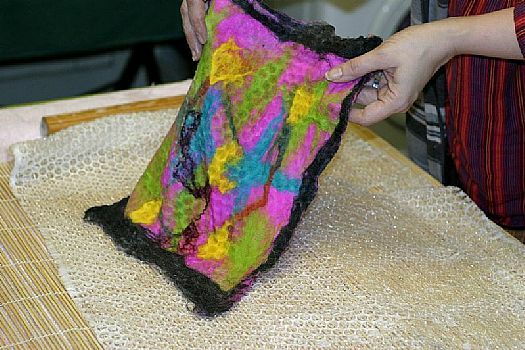 As long as the wool scales can hook into the fabric, it will stay attached to the felt. Beads can be felted in by placing thin pieces of wool right over the bead so that it creates a pocket. This is tricky and you may find it more fun to sew them on afterwards. 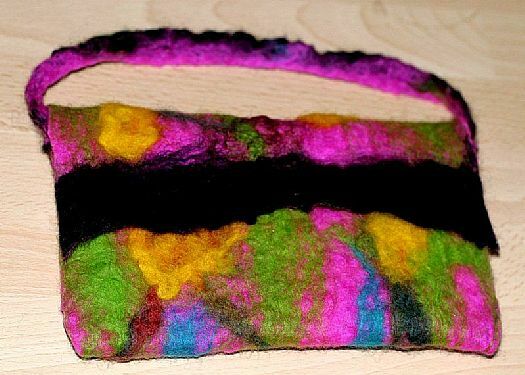 When you are happy with your design you are ready to start felting. 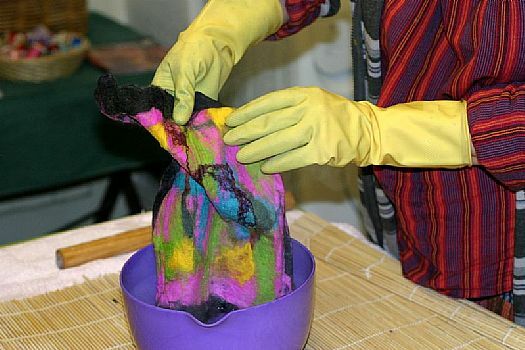 With your hand-hot water in the plastic carton, liberally sprinkle the wool so that it is wet all over. Push the water into the wool to thoroughly saturate it. If you try doing this with your naked hand, you will find wool sticking to you and coming away from the pattern you have created. 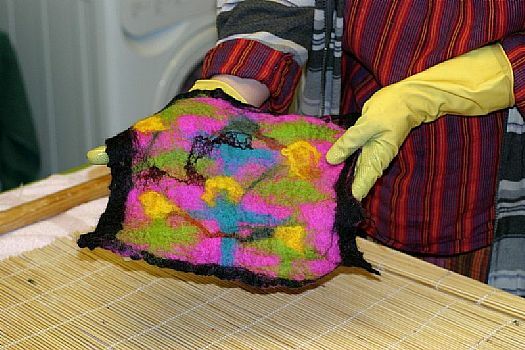 Cover your hand with the plastic bag and dab at the wool with this instead. 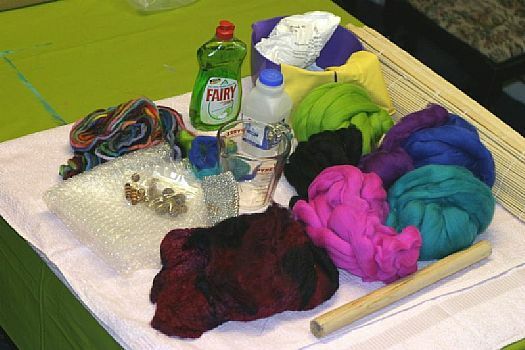 Add more water if you need it and if it doesn't appear to be very soapy then sprinkle a few drops of washing up liquid directly onto the wool. Now you need to cover the wool with the rest of the bubble wrap folded over. Sprinkle a little water on the bubble wrap so that you can rub the wool through it without friction. Using your fingertips, massage the wool quite hard for a couple of minutes. Pay special attention to the edges. Place the piece of dowling at the edge of the Chinese blind and carefully roll the whole piece up. When it is fully rolled you are ready for the physically tough bit. I put loud rock music with a good strong beat on for this. Pushing down hard, roll the bamboo back and forwards 50 times, don't let the wool and bubble wrap work loose, just keep it steady and rhythmic. Caution - this IS hard work so make sure you have a comfortable stance or you will end up with dreadful back ache. I stand with my legs apart and leaning forward as if I were playing snooker. 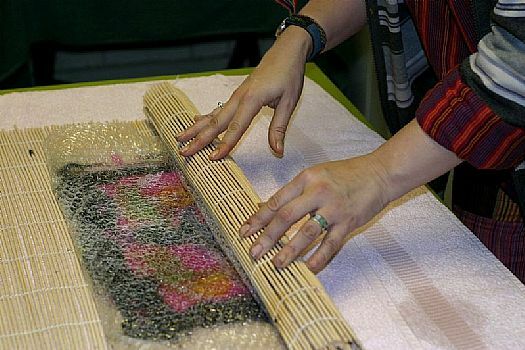 When you have rolled the wool 50 times, unroll the bamboo and turn the whole piece of bubble wrap through 90 degrees. Roll it up again and do another 50. Repeat the process twice more turning through 90 degrees each time. This is to prevent the felt shrinking too much in one direction. You might like to stop for a coffee break at this point... but think of how trim and fit you'll be! Unroll the bamboo and unwrap the bubble wrap carefully. The wool should now miraculously be a piece of felt. More precisely it is called pre-felt at this stage. Discard the bubble wrap and the dowling into the sink and place the felt directly onto the bamboo. Refill your plastic carton with very hot water and sprinkle the felt liberally. Add more washing up liquid if it is not looking soapy enough. 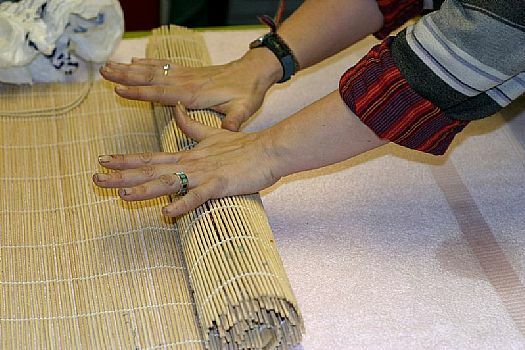 Roll the felt up in the bamboo again and roll it back and forward another 20 times in each direction. You can speed the felt up even more by pouring boiling water directly onto the rolled felt. Watch out for splashes and at this point you might like to put on the rubber gloves. You should now have a soggy, soapy piece of felt. The fibres should be firmly matted into one another and the fabric should be strong enough to withstand a vigorous tug. Fill the bowl with boiling water and submerge the whole piece. 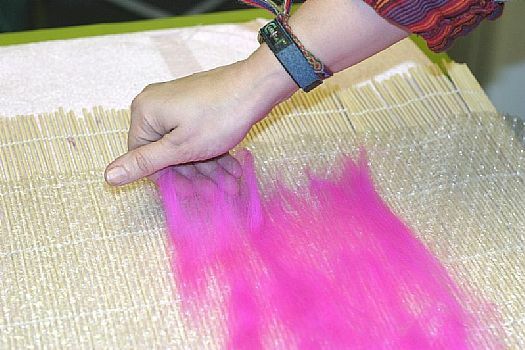 Squeeze the excess water out and then throw the bundle of felt as hard as you can onto the bamboo. This is fun. Very cathartic. Continue soaking the felt, squeezing the water out and chucking it at the table for a few minutes. Nearly done. Give the felt a final thorough rinse in cold water adding a couple of drops of the vinegar to counteract any lingering soap and leave to dry. Even with only two layers, my felt is very strong. I've cut and sewn this into a small bag which will be durable for a long time. For more complicated projects like hats or slippers, I can very highly recommend 'How to make Felt' by Anne Belgrave published by Search Press which is available from Amazon. And finally, as I am in the UK, all my suppliers are British companies. I have had a good look around the internet though and found some US suppliers that look as if they might provide a decent range of materials.